Special Cover on Raksha Bandhan - 28th July 2017. Raksha Bandhan means a bond of protection. It is observed on the full moon day of Shravana. On Raksha Bandhan, sisters tie a rakhi (sacred thread) on their brother’s wrist with a prayer for his prosperity and happiness. This symbolizes the sister’s lover towards the brother. The brother gives her a gift and promises to protect her. 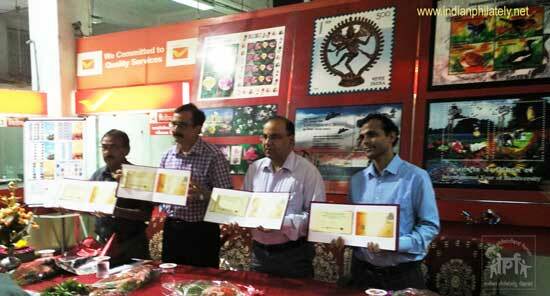 Special Covers on Raksha Bandhan were released on Pan India basis by Department of Posts. At Vadodara a Special Cover was jointly released by Shri Vineet Mathur, Post Master General, Vadodara Region, Shri B. L. Sonal, Director Postal Services, Vadodara Region, Shri Prashant Pandya, President, Baroda Philatelic Society and Shri Sidodia, Dept. of Posts. Special Cover on Raksha Bandhan – 15th July 2017. A Special Cover on Raksha Bandhan was released at Dehradun on 15th July 2017. Cancellation on the Special Cover is marked with date of release 15th July 2017. At other places date is not mentioned in cancellation. (Special Cover Approval No. UK/04/2017). 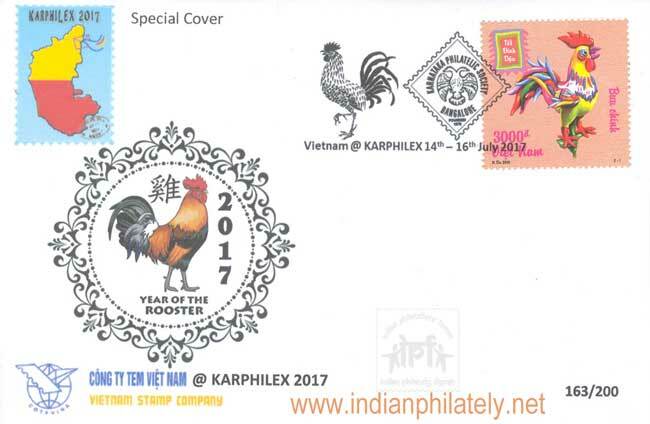 Karphilex 2017 Philatelic Exhibition at Bengaluru – 14th – 16th July 2017. 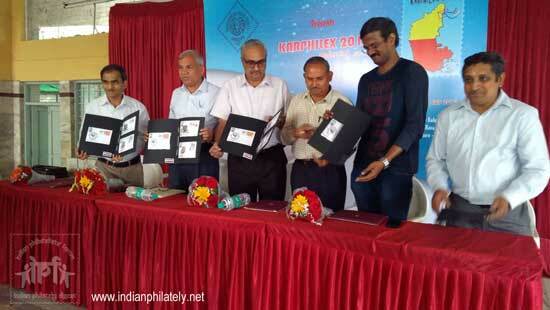 Karphilex 2017 philatelic exhibition is organized by the Karnataka Philatelic Society at Bengaluru from 14th to 16th July 2017 with the support of Karnataka Postal Circle. The exhibition was inaugurated by Chief Postmaster General, Karnataka Postal Circle Dr. Charles Lobo on 14th July 2017 at Sri Raja Rajeshwari Kalyana Mantap, Rajaji Nagar, Bengaluru. 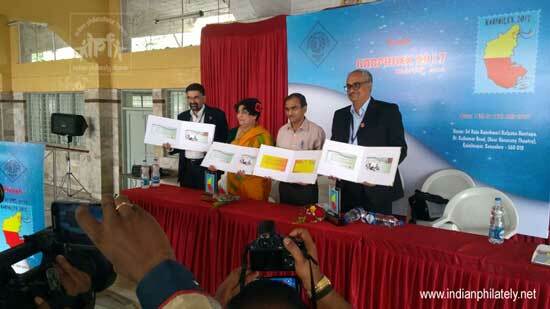 On the inaugural day, a Souvenir and two Special Covers were released by CPMG Dr. Charles Lobo, renowned philatelist Dr. (Mrs.) Sita Bhateja, KPS President Shri K. Chaitanya Dev and Shir Nikhilesh Melkote of KPS. Two new special covers released are on Learn Kannada Speak Kannada and Karnataka's Sporting Legends. Special Cover on Learn Kannada. Speak Kannada – 14th July 2017. Kannada is one of the ancient languages of India. It is a prominent Dravidian language. In 2008 the Government of India awarded Kannada, the status of classical language. Kannada is a verbal language of 49 letters that are divided into vowels, consonants and yogavahas (neither vowel nor consonant). Kannada letters and digits originate from the Brahmi script of Ashoka period. The phases in evolution of Kannada script can be observed from the period of Badami Chalukyas, Rashtrakutas, Kalyani Chalukyas, Hoysalas, Vijayanagar Empire until the period of Mysore kings. Until recently Halmidi inscription (450-500 AD) was considered as the oldest inscription of Kannada, but recently the Archaeological Survey of India has found an inscription older than Halmidi at Talugunda, near Shiralakoppa in Shikaripura taluk of Shimoga District, Karnataka dating back to 370-450 AD (Special Cover approval no. KTK/57/2017). Special Cover on Karnataka's Sporting Legends – 14th July 2017. A Special Cover featuring Prakash Padukone, Anil Kumble and Pankaj Advani, sporting legends of Karnataka (Special Cover approval no. KTK/57/2017). Prakash Padukone won his first national senior championship in 1971 at the age of 16 and become youngest player to achieve this feat. Thereafter he set a record of nine national titles in a row. He achieved his first major international title in 1978 when he won the men’s singles gold medal at the 1978 Commonwealth Games in Edmonton, Canada. In 1980, he went on to win both the Danish Open and the Swedish Open. His biggest career achievement happened in 1980 when he won the men's singles title at the All England Championship. He won the first Alba World Cup in October 1981 at Kuala Lumpur. After an illustrious playing career, he retired in 1991. No bowler in history won India more Test matches than Anil Kumble. He played 132 Test matches for India collecting 619 wickets. He also played 271 ODls taking 337 wickets, in the process becoming the highest wicket taker for India in both formats. After having played for 18 years, he announced his retirement from international cricket in November 2008. He holds the World Record for getting all 10 wickets in a single innings of a Test match against Pakistan at Ferozshah Kotla Delhi in 1999 (10 wickets for 74 runs). He is only the second one in history to do this after Jim Laker. He also has captained the Indian Cricket team and served as the Head Coach. He was awarded the Arjuna award in 1995 and the Padmashri in 2005. At the tender age of 18, Pankaj Advani won his first World Title. He is the only person in history to have won both the billiards and snooker IBSF World Titles as well as the World Professional Billiards Championship. He was the first person ever to win a "Grand Double" (both the points and time formats in the same year) in 2005. Pankaj repeated the same feat at the 2008 World Championships. In 2014, he created a world record by winning the Grand Double for the third time. A gist of his achievements: World Billiards Champion (Points Format) 4 times, World Billiards Champion (Time Format) 7 Times, IBSF World Snooker Champion Twice, IBSF World Six-Red Snooker Champion Twice. He is also 26-time Asian Billiards Champion, and won 29 Junior and Senior National titles. He was awarded the Arjuna Award in 2004, the Rajiv Gandhi Award in 2004, the Rajiv Gandhi Khel Ratna Award in 2006 and the Padmashri in 2009. 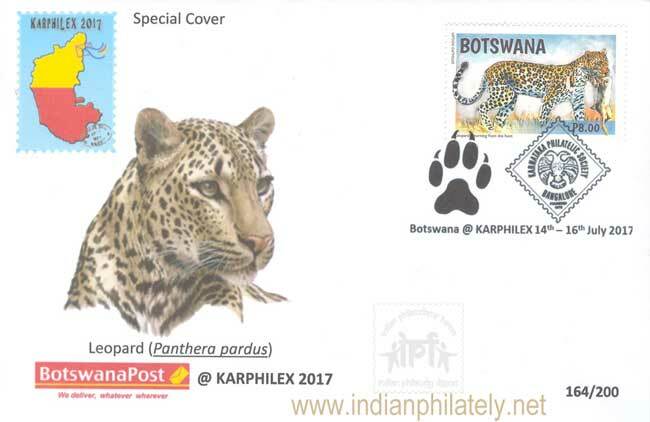 On the second day of the exhibition three special covers on wild life theme in limited numbers (200 each) were released by Postal Administrations of Botswana, Namibia and Vietnam to mark their presence at Karphilex-2017. This may be the first time a foreign postal administrator released Special covers at a regional philatelic event in India. 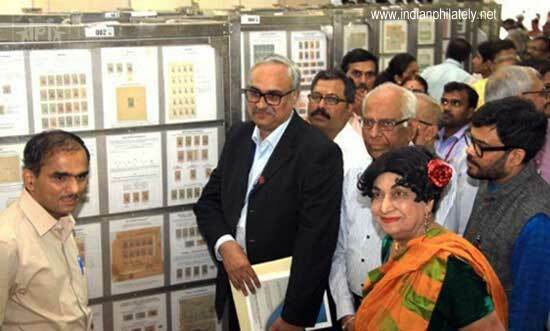 During the exhibition several philatelic activities like, Quiz Competition, Prepare Bookmarks and hand folded envelopes, selfie with stamps, seminars, treasure hunt, lucky dip competition etc. 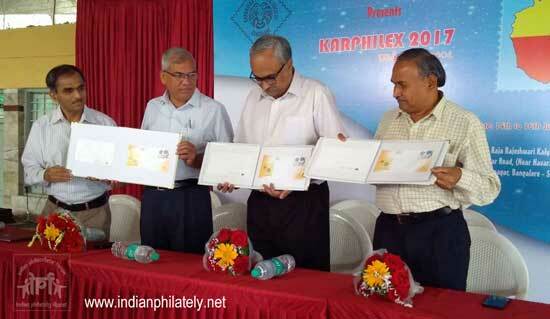 were organized by the Karnataka Philatelic Society. 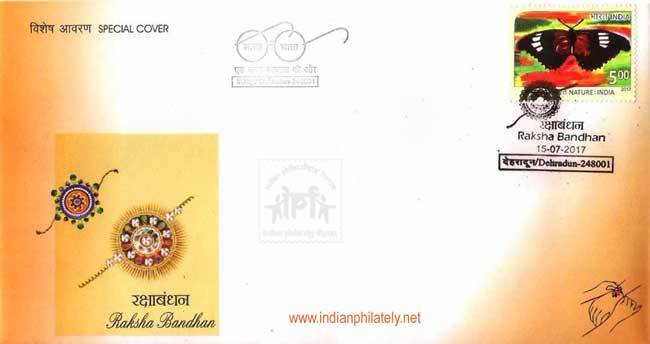 A Special Cover on Raksha Bandhan was released on Pan India basis by Department of Posts. 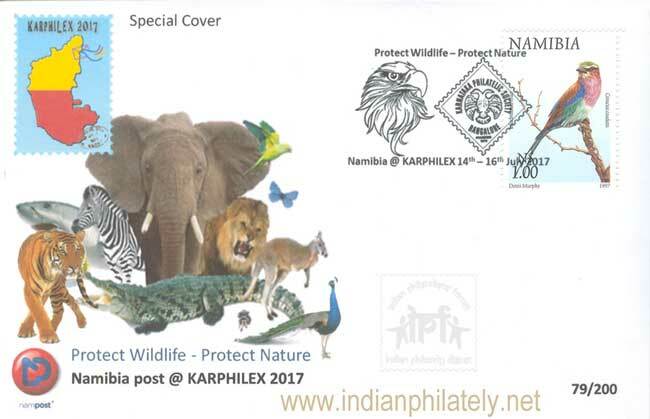 At Bangalore Karnataka Postal Circle released the special cover at Karphilex 2017 exhibition venue. Interesting to note that the cancellation does not have the Date mentioned (Special Cover Approval No. KTK/59/2017). Special Cover on theme ‘Say NO to Tobacco’ – 10th July 2017. Tobacco is the biggest enemy of public health today. The effects of tobacco use, as we all know, are destructive and widespread. Not many know that tobacco is one of the primary causes of cancer and heart attacks. Many youngsters, in both cities and rural areas, are getting addicted to tobacco use in various forms, which, in the long run, can have an adverse effect on health and life of the population. Tobacco smoke contains approximately 4,000 chemicals in cigarettes, 100s of which are toxic like formaldehyde, ammonia and cadmium. These constituents of cigarettes have a detrimental effect on everything: from the body’s immunity to the functioning of the organs. Tobacco is stealing away all those wonderful moments from your life. To create awareness about tobacco hazard a Special Cover on the theme of 'Say No to Tobacco' was released by Shri Rajendra Kumar, Postmaster General, South Karnataka Region in presence of Dr. P. L. Nataraj, Director, Health and Family welfare, Govt. 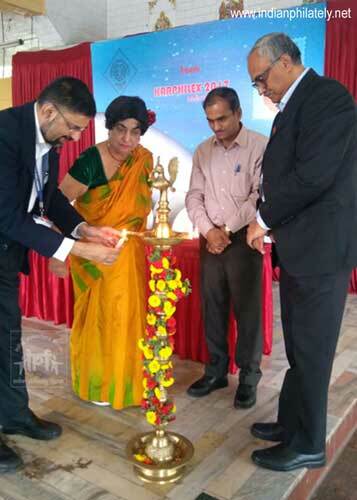 of Karnataka, Dr. Prabhakar, Joint Director (Medical), Dr. Saroja, Project Director, Dr. Sevaraj, and Dy. Director at Bengaluru GPO on 10th July 2017 (Special Cover approval no. KTK/55/2017). Special Cover on 22nd Asian Athletics Championships Odisha 2017 - 5th July 2017. The 2017 Asian Athletics Championships is the 22nd edition of the Asian Athletics Championships organized from 5th to 9th July 2017 at the Kalinga Stadium in Bhubaneswar. The Asian Athletics Championships are organized by Asian Athletics Association every two years. Bhubaneswar is the third Indian-city to host the Asian Athletics Championship with Delhi in 1989 being the first and Pune in the year 2013 to be the second Indian cities. Around 800 athletes from 45 countries attended the event. A Special Cover was released to commemorate the 22nd Asian Athletics Championships on 5th July 2017 at Bhubaneswar (Special Cover Approval No. OD/09/2017). 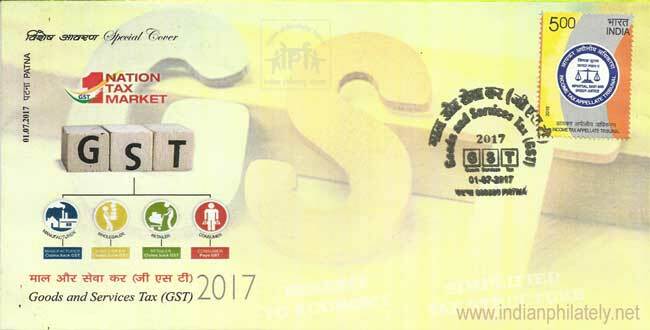 Special Cover on Introduction of GST – 1st July 2017. The introduction of Goods and Services Tax (GST) is a very significant step in the field of indirect tax reforms in India. By amalgamating a large number of Central and State taxes into a single tax, it mitigates cascading or double taxation in a major way and pave the way for a common national market. 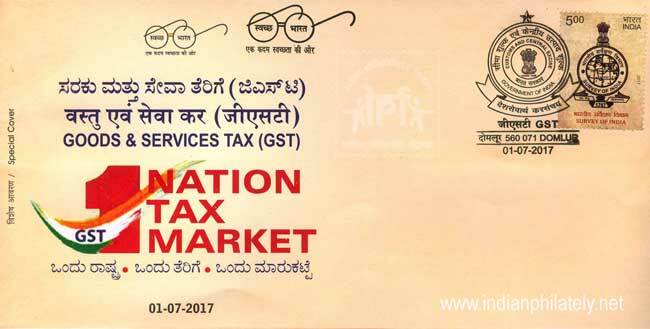 On the occasion of introduction of Goods and Services Tax (GST) a Special Cover was released at Domlur on 1st July 2017 (Special Cover Approval no. KTK/56/2017). Another Special Cover on introduction of GST was released at Patna by Shri M. E. Haque, Chief Postmaster General, Bihar Circle and Shri Anil Kumar, Postmaster General on 1st July 2017 (Special Cover Approval No. BH-02/July 2017).